It’s beginning to look a lot like Christmas! We finally have snow that is here to stay for the season after a large snowstorm passed through this past week and temperatures are staying below freezing. During the snowstorm did I ditch going to the gym after work in order to snuggle under a blanket at home, drink hot cocoa, and watch the snow fall before it got too dark to see it anymore? Yes, yes I most certainly did! Growing up on the Central Coast of California I never had a white Christmas. Of course I had always dreamed of them, and when I finally got the chance to experience a white Christmas for the first time 2 years ago, it truly was even more magical than I had imagined! The snow and coldness add to the feeling of hygge that runs strong in me during the winter months. If you don’t know what hygge is - you aren’t alone! Hygge (hoo-ga) is a Danish word to describe a sense of cozy contentment through enjoying the simple things in life. To me, hygge means lighting our home with soft lighting in the form of lamps, twinkle lights, and candles - and avoiding harsh overhead light. It means cozying up with my husband, either reading books or watching movies. It means being on my phone less (though this is still a work in progress). It means getting out into the cold weather to embrace the season with snowshoeing, cross country skiing, and ice skating. It means indulging in hot cocoa and cider. It means baking and cooking as the warmth from the oven heats our apartment, and the fragrant aromas fill our home. Which brings me to today’s recipe - GNOCCHI! 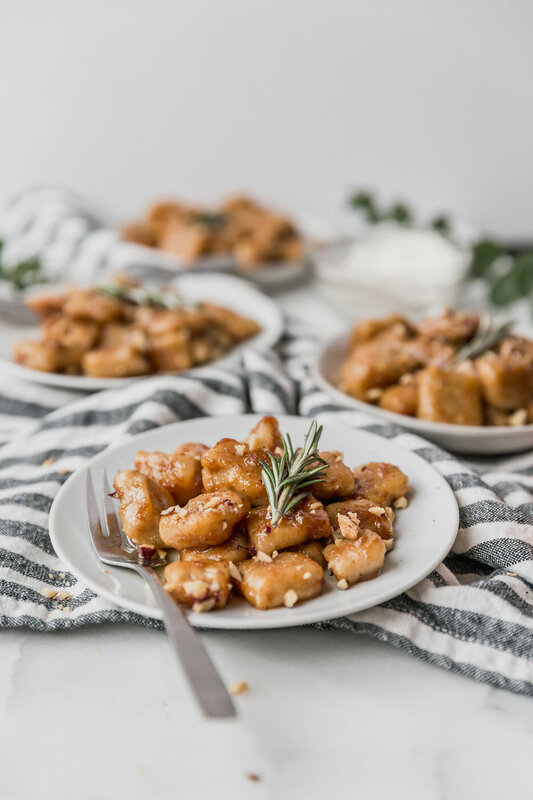 This sweet potato gnocchi recipe is a labor of love, but incredibly worth the effort. Add some Christmas music and a warm fire and you will have the perfect hygge day! ;) The base of this gnocchi is sweet potato, flour, cheese, and egg. 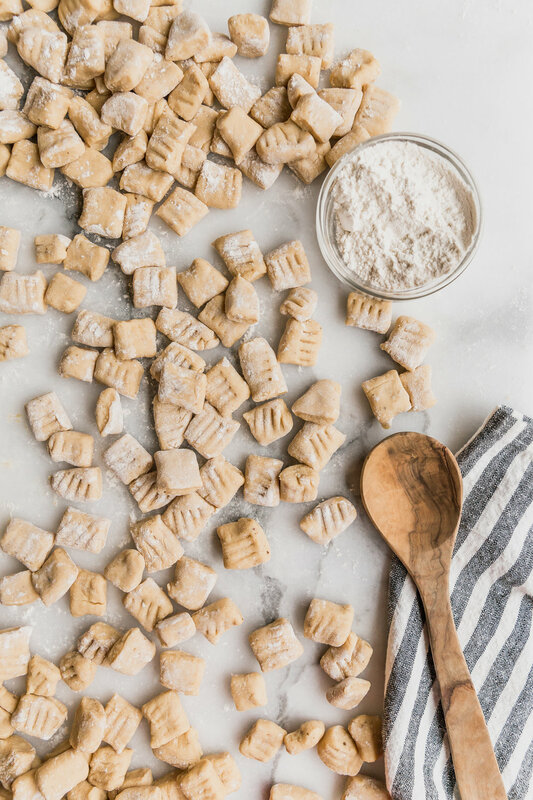 After forming the dough, you will work with slices of the dough to create thin ropes of dough, from which the individual gnocchi pieces will be cut. Before the gnocchi is pan fried, it is INCREDIBLY sticky. For that reason, it works best to keep the gnocchi well floured to prevent sticking to each other, which can cause tearing when trying to separate them. (Be sure to look at the baker’s tips at the bottom of the recipe!) The sauce is a brown butter walnut sauce, composed of butter, milk, brown sugar, and sage. The sweet, nuttiness from the sauce perfect complements the earthy tones of the gnocchi. So invite some friends over, light some candles, and enjoy a lovely dinner with this recipe. Slice the sweet potatoes in half, lengthwise. Place face down on a baking sheet. Drizzle with olive oil, and sprinkle with a pinch of salt and pepper. Bake for 45 minutes. Remove from oven, and let cool until cool enough to handle. Reduce the oven to 350F. As the potatoes cool, bake the walnuts for ~15-20 minutes, or until browned. Set aside. Peel the potato skin away. Using a food processor or blender, blend the potatoes until completely smooth. Transfer to a large bowl. Add the ricotta, egg, parmesan, salt, and nutmeg. Whisk until combined. Add the flour, 1/2 cup a time, until a dough forms. * The dough should be damp but not stick to your finger when you touch it. Transfer the dough to a floured surface. Form into a loaf, and cut 1 inch slices - as if you were cutting slices from a bread loaf. We will work with one slice at a time. The cut edges can be very sticky, so with floured hands sprinkle flour on to coat those cut edges. This will prevent the dough from sticking to the surface as you roll it. With floured hands roll the slices into a rope with ~1/2 inch diameter. Cut into 1/2 inch pieces. With floured hands, lightly coat the cut edges of the gnocchi to prevent sticking. (Optional) Use a fork to create indents on the gnocchi. Repeat the above step with the remaining slices of dough. Line a large baking sheet with a silicon mat or parchment paper, set aside. Bring a large, salted pot of water to a boil. In batches, cook the gnocchi in the water until they float (~1-2 minutes). * Transfer to the pre-lined baking sheet, placing in a single layer. It is important not to stack the gnocchi as they will become very sticky as they dry. Repeat with the remaining gnocchi. Reserve the used water. We will make the sauce in two batches. In a large saucepan, melt 5 Tablespoons butter. Add 1/4 cup brown sugar, 6 Tablespoons milk, and 1/2 teaspoon sage. Stir until combined. Again working in batches, add 1/6 of the gnocchi, placing in a single layer in the pan to brown. Pour 2 Tablespoons of the reserved water over the gnocchi. Once one side has browned, individually flip the gnocchi to brown the other side. Once both sides have browned, transfer the gnocchi to a plate. (Because they have now been fully cooked, they wouldn't be as sticky so you no longer have to keep them in a single layer). Repeat the browning process with another 2 batches of gnocchi, adding the 2 Tablespoons of reserved water for each batch. Make the second batch of sauce. Again, melt 5 Tablespoons of butter. Whisk in 1/4 cup brown sugar, 6 Tablespoons milk, and 1/2 teaspoon sage until combined. Brown the remaining 3 batches of gnocchi like the step above, adding 2 Tablespoons of reserved water with each batch. Serve warm, and sprinkle the browned walnuts on each serving. I found that it worked best to work the dough with my hands once I reached 2 cups of flour. I found it worked best to transfer the batches of gnocchi into the boiling water with a spider ladle. How to make ahead of time: Prior to cooking the gnocchi in the water, arrange in a single layer on a silicon or parchment paper lined baking sheets. Place in the freezer for 2 hours or until frozen. Once frozen, transfer to a storage container, and keep in the freezer until ready to cook. You can store gnocchi for up to 2 months. When ready to use, do not thaw the gnocchi. Transfer the frozen gnocchi directly to the boiling water, picking up at Step #11.